The UniNet iColor 500 media transfer printer is a digital transfer media printer that allows for both white underprint- and white over-printing in a single pass thanks to the optional iColor Transfer RIP software and a white toner kit. This full color media transfer printer includes the most opaque white toner available — twice that of other white toner media transfer printers — resulting in the brightest whites and most solid backgrounds. A Versatile Media Transfer Printer — and an Apparel Printing Super Star! In addition to its white toner, the iColor 500 includes a true black toner cartridge. 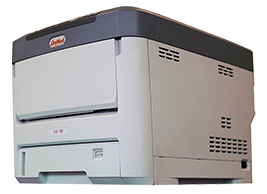 Thus, when not using it as a digital transfer media printer, you can use it as a standard color laser printer to print beautiful full color CMYK materials such as brochures, flyers, labels, or banners. Optional toners for the iColor 500 include sublimation, fluorescent, clear, and security toners. It’s easy to swap out toners as needed, making the iColor 500 one of the most versatile media transfer printers on the market. Meanwhile, the iColor 500 media transfer printer produces the most durable media transfers available with a predicted durability of over 100 wash cycles. Media transfers printed with the iColor 500 work beautifully with cotton, polyester, 50/50 blends, and even delicate synthetics requiring low heat applications. Not only is the iColor 500 extremely versatile due to its wide assortment of color, true black, white, and optional toners, it is also powered by LED technology. This low temperature fusing technology allows the digital transfer media printer to print on media that has previously been off limits to laser printers due to heat and melting concerns. With the iColor 500 media transfer printer, you can print on plastic, PET, clear, and other low-temperature media without worrying about damaging the printer or wasting transfer media. Combining the iColor 500 media transfer printer with a Stahls’ Hotronix Fusion Heat Press creates a complete solution for producing custom t-shirts, aprons, jerseys, and other custom apparel. We have everything you need to set up your own custom t-shirt business including media transfer printers, heat presses, and transfer media. Paper Sizes: The multi-purpose tray has a 100-sheet capacity and holds sheets measuring from 3 to 5 inches to 8.5 by 14 inches. The paper cassette accommodates sizes from 5.8 by 8.3 inches to 8.5 by 14 inches as well as banners measuring 8.5” by up to 52 inches. Size (WxDxH): 17.1" x 21.5" x 15.3"
What Can You Print with the iColor 500 Digital Transfer Media Printer? - Media transfers intended for decorating t-shirts, sweatshirts, aprons, hats, tote bags, mousepads, jerseys, and other apparel. - Media transfers intended for leather, tile, metals, window clings, acrylic, wood, and more. 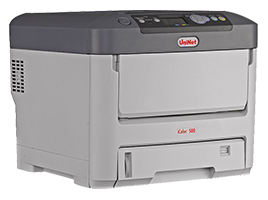 The iColor 500 media transfer printer is backed by a one-year parts and labor warranty. DuraFast Label Company carries a wide variety of media transfer sheets, label stock, and other media for the iColor 500. In fact, we have everything you need to get started with digital transfer printing including the iColor 500 media transfer printer, replacement toner cartridges, media, and accessories. Get started today!